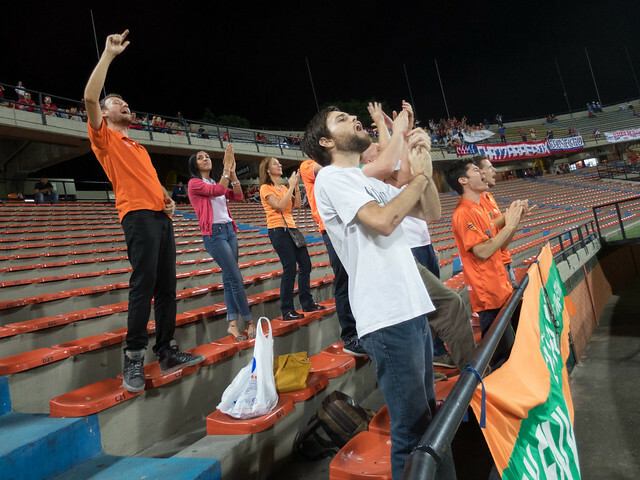 April 16, 2014 — Envigado FC’s only match of the first (of two) 2014 Liga Postobon seasons at Estadio was tied 2-2 with less than 10 minutes to play when a police officer approached us in the stands, advising us to leave early. He said it was in our own best interest, and that it’d be harder for them to protect us once the game was over, when the walkways and streets around Medellín’s soccer stadium would be filled with fans of the opposing team, Deportivo Independiente Medellín (DIM). I turned around and noticed several other police officers a few rows back. They’d been keeping a close eye on us the whole match. Violence is still a part of Colombian soccer, with fans of away teams being attacked and killed simply because they’re supporting the wrong team, and here were a group of gringos wearing orange in support of the away team, amidst a sea of home team fans wearing red and blue. Seriously, there were 20 of us in a stadium filled with thousands of DIM fans. And we weren’t quietly sitting there. Well, I was, but the rest of the guys were singing songs of support they’d made up for Envigado FC, thus drawing even more attention to us. The police were concerned, which was enough to make me concerned too. My friend Adam (UK) had been living in Envigado since late last year, and while I originally hoped he’d be the one to write this article, he’s currently en route to the 2014 World Cup in Brazil. 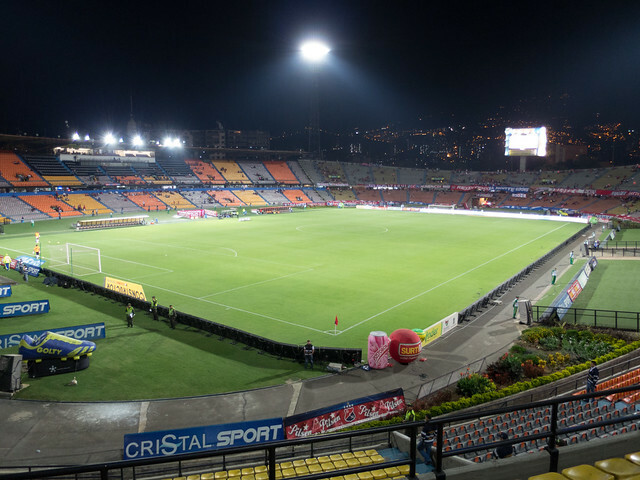 Envigado FC is a relatively new team in the Colombian national league, having existed for only about 25 years versus DIM’s 100 years (a centennial celebrated with plenty of fireworks in November 2013). As such, and being that they are from a smaller city than Medellín, with a high school size stadium, they don’t have a huge groundswell of local support. 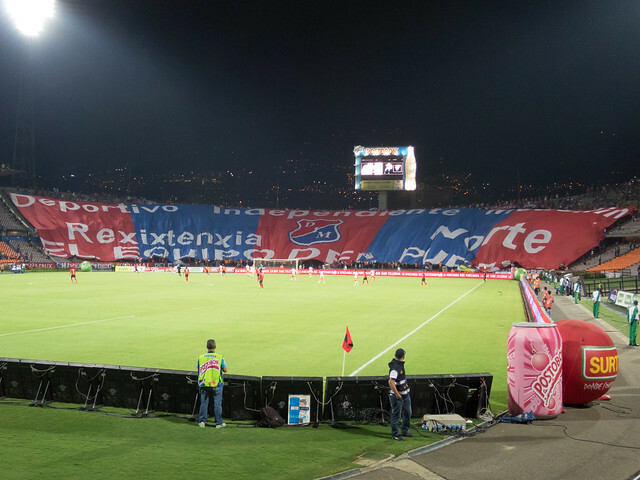 Most paisas have long ago chosen between the big two teams, DIM and Nacional, and those loyalties are often passed down from one generation to the next. And herein laid the opportunity for a bunch of serious soccer fans, who also happened to be foreigners, to make a name for themselves supporting Envigado FC. I became aware of this new fan club through Adam, as he began inviting me to matches. His persistence lead me to Envigado’s away match versus DIM at Estadio April 16, 2014. We met up at the Estadio metro stop before the game, and walked over to the nondescript, and hard-to-find box office. We bought tickets in the southern end of the stadium for 17,000 pesos each, plus a 2,000 peso service charge (19,000 pesos or $10 total). After passing through a few security pat-downs, we began making our way to the upper deck in the south end, only to find some police officers advising us against sitting up there, as it would be near one of the rowdier DIM fan clubs. Despite Ollie Lythe and others saying they actually know people in that fan club, we followed the officers’ suggestion and took some front row seats on the lower deck. Our seating acquired, some of the guys hung homemade banners from the railings. The match was a fun one, with Envigado FC scoring twice in the first half, leaving it 2-0 Envigado entering the halftime break. Needless to say, La Familia Naranja was all smiles. The second half of the match was another story. DIM rallied, scoring two unanswered goals to tie the match at 2-2 going into the final minutes. Envigado FC was no doubt the underdog in this game, but it was still important for them to try to eek out a tie, if not a win, in order to solidify their spot in the upcoming league playoffs. With the clock ticking down, and police officers suggesting we leave the match early, I joined my friend Nancy in an early exit. We didn’t want to take any chances, and while neither of us were wearing orange, our friends were. By the time we’d walked down the stairs and out of the building, we heard a huge eruption of cheers. DIM had scored the third and winning goal of the match. Final score: 3-2 DIM. There’d been a serious collapse of Envigado FC’s defense in the second half, but La Familia Naranja kept it in perspective. You win some, you lose some. That’s the nature of competition. 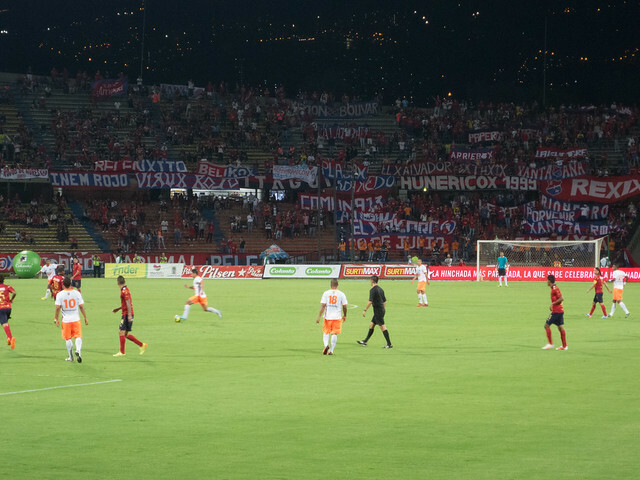 Envigado FC would go on to qualify for the playoffs, only to lose in the first round to a much stronger Nacional team, which would also go on to win the league championship, as well as make it to the quarterfinals of Copa Libertadores. Want to support Envigado FC? Join La Familia Naranja’s Facebook group to stay up-to-date with team news, meet-ups and matches. This is an interesting story, but it seems to me a bit juvenile to ignore the real dangers. Well, as adults, that’s a call each of us had to make. Thankfully, nobody ran into problems after the game let out, but the point is you never know around the stadium as some of the wilder fans get drunk before the games, or are doing drugs in the stadium. Then there’s the whole mob mentality you have to watch out for once the game is over. I couldn’t make it to the game, but from what I hear the Medellin fans came down to show their respect to the Envigado fans for staying and supporting the team. You are generally right about following security advice, but the barras of DIM don’t really have a history of conflict or any particular grudge against Envigado at this point, which is why it was all smiles and handshakes at the end. I know it’s the Nacional v DIM rivalry that tends to result in the biggest problems. I’m glad my first match back in 2009 was a superclasico, because the atmosphere was incredible, but I don’t plan to attend another any time soon.